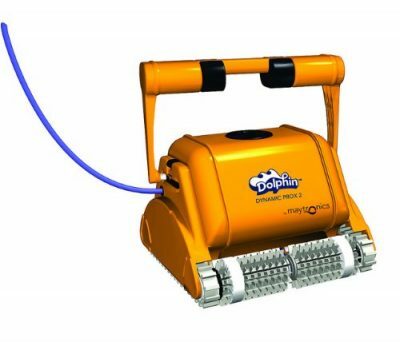 The Dolphin Dynamic Pro X2 Swimming Pool Cleaner is an ultra-tough, ultra-intelligent robot for commercial swimming pools. 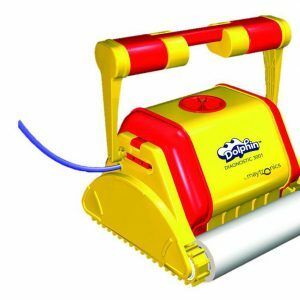 The Dolphin Dynamic Pro X2 Commercial Swimming Pool Cleaner by Maytronics complete with Wonderbrushes is an Extra-Robust Commercial Automatic Robot Swimming Pool Cleaner that is specially designed for professional pool cleaning and public swimming pools up to 25 metres (84 ft). The Dolphin Dynamic Pro X2 scrubs, vacuums, sweeps and filters a swimming pool from waterline to floor in less than six hours. It uses a patented Gyroscopic tracking system to intelligently scan the pool and advanced dual motors enable the on-board computer to apply the most efficient cleaning path, covering the waterline, walls, stairs and pool floor. Using the Dolphin Dynamic Pro X2 in your pool will Save you water and energy, help to prevent germination of algae and bacteria and reduce the number of required backwashes. It scrubs, brushes, vacuums and filters the entire pool floor, walls and waterline. Advanced software enables efficient cleaning. Large self-contained inner ultra-fine Micronics filter bag with clogged filter bag indicator collects dirt, debris and even fine dust particles. Wireless remote control for manual and automatic cleaning, Wide range or cleaning programs and parameters: Cycle time, Climbing Frequency, Swimming Pool Length, Regular or Ultraclean, Lap pool and Waterline. Environmentally-friendly cleaning process disperses chemicals evenly in the pool, and therefore reduces the use of chlorine and other chemicals. Patented swivel prevents the cable tangling and twisting. Dual motor manoeuvrability for precise performance.